Diligent dental hygiene can reduce and even avoid caries and periodontitis. We offer you professional cleanings, caries prophylaxis and complementary treatments to periodontal therapies. Our patients with implants are of special importance to us, as we have designed a special implant prophylaxis-programme for them. The professional cleansing starts off with a careful exmaination of your denture, a systematic analysis of the status quo, diagnostics, and a clarifying talk about the dos and don'ts of dental care. After that, the stains will be taken off your teeth, from the surface and in between the teeth to gingival pockets. 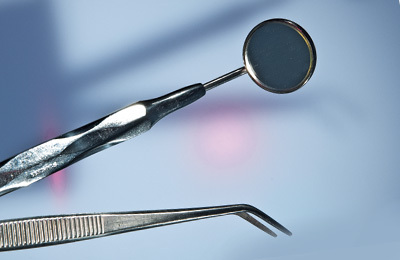 As bacteria multiplies preferably in uneven environments, we will even out your dental surface by a polishing process. At the end of this treatment, your cleaned teeth are sealed with a fluoride varnish in order to protect your teeth from the acids of the oral flora. By the help of this gadget, a mixture of water and air is complemented by a cleansing powder (calcium carbonate, sodium bicarbonate or glycine powder)with which discolourings and pigment coverings are cleansed. The cleaning of gingival pockets is very difficult and must be executed by experienced hands, as it requires special instruments. After the cleansing, your teeth need polishing. The surface of your teeth has become more uneven during the previous steps of treatment, which would increase the chance of new bacteria to nest. In order to avoid this from happening, the plain surfaces of your teeth will be cleaned by rubber intstruments and little brushes, as by peeling tooth paste. In the end, a caries blocking varnish or solution is applied to all surfaces. Fluorides encourage the reestablishment of enamel molecules within the tooth (remineralisation) and prevent it from new acid attacks. Fissures are little dents, cracks and furrows on the chewing surface, in shich bacteria nists in, shich is hard to get rid off by a simple tooth brush. Bacterias create acids, their metabolites, which cause caries. To prevent this from happening, we seal all fissure reachable.